This laptop has many features all of which are superb. I have been using this for two years and i must say that it is brilliant. 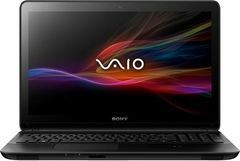 The most salient feature is hand motion sensor, introduced for the first time by Sony Vaio. So, this is best mid range laptop and u should buy. Hand Motion Sensor (U can play video or images without using hand). 1GB Nvidia GeForce GT740M (U can play movie like full HD & Advanced Gaming). 4GB Ram (expandable upto 4GB). Led Backlit Display is good & Display size 15.6". Sound Quality is very good like surround. Mouse pad touch smooth is working & different gesture is working good. USB 3.0 2 port & 2.0 2 port. Web cam quality is good camera Carl Zeiss. Has no VGA Port using extra tv display like movie or gaming. Battery has short backup only 4 Hours.